Short introduction & site plan. Dynamics of regional climate systems. Physical-biogeochemical coupling of marine systems. Theoretical Oceanography and Numerical Modelling. Coastal Sea: Management and Planning. The surface mixing layer (SML) is the ocean side of the air-sea interface through which the fluxes of energy, momentum, and tracers have to pass in a coupled atmosphere-ocean system. Pathways and transformations of energy, momentum and tracers in the SML are complex, highly variable, and not suciently understood at the moment. Even in high-resolution ocean models, energy and momentum budgets for the surface layer are energetically inconsistent because the additional energy reservoirs and transformations due to unresolved processes (e.g., mesoscale/submesoscale motions, surface waves) are either ignored or not consistenty taken into account. In our group, we currently focus on the dynamics and energetics of SML fronts and filaments. 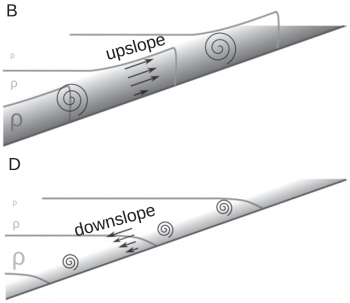 Different types of frontal instabilities may develop in the vicinity of such features, with important consequences for the transfer of energy among different processes and scales. We study these processes with the help of a high-resolution experimental approach, based on data from frontal regions in the Baltic Sea and the South Atlantic. We collaborate with reserachers from IOW's regional modeling group and the Helmholtz Center for Coastal Reserach in Geestacht, who investigate similar processes with the help of high-resolution numerical models. The project is embeded in the large-scale research project on "Energy transfers in Atmosphere and Ocean" (TRR181), funded by the German Reseach Foundation (DFG). In nearly all stratified marine basins, exchange processes between the seafloor and the interior water column play a crucial role in the basin-scale biogeochemistry of the system. Within this project the aim is to identify, analyse, and quantify the physical processes contributing to the exchange of dissolved substances between the sediment-water interface, the turbulent BBL, and the weakly turbulent interior of stratified basins. The focus will be on the effect of sloping topography, where the exchange is complicated by the interplay between BBL restratification, BBL turbulence, and sub-mesoscale processes that are assumed to determine the lateral exchange of fluid between the BBL and the interior. These processes will be investigated here with a combined experimental, theoretical, and numerical modelling approach. Panel (A): Conceptual sketch of the stratified near-bottom region (isopycnals in black) near a sloping bottom boundary layer (BBL: gray-shaded area). Coloured contour lines indicate isolines of oxygen (green) and sulphide (purple); corresponding sediment-water fluxes are denoted by arrows. Panels (B-D): Different scenarios illustrating the effect of near-bottom turbulence on oxygen profiles (in colour). Lower part of the BBL with (B) weak BBL turbulence, thick DBL, and therefore small sediment-water oxygen fluxes, and (C) strong BBL turbulence, thin DBL, and therefore large sediment fluxes. (D): View of the entire BBL (note the different vertical scale) with decreased oxygen fluxes at the upper edge of the BBL, leading to low concentrations within the BBL. 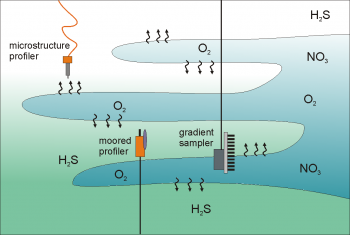 Sketch of small-scale interactions between intrusions and ambient waters with different biogeochemical composition. Arrows indicate solute exchange due to mixing of intrusions and adjacent water. In an interdisciplinary project, conducted in collaboration with colleages from IOW's departments of marine biology and marine chemistry, we are currently investigating the role of intermittent intrusions and mixing on the microbiology and biogeochemistry of pelagic redoxclines (oxic-anoxic interfaces) based on a purely experimental approach. One key component of the project is a moored autonomous profiling system in the central Baltic Sea, developed in collaboration with IOW’s chemistry department, in order to study the evolution of the Baltic Sea redoxcline over longer time scales. For the purpose of this project, this platform was extended by an autonomous turbulence microstructure package and a high-resolution current profiler (ADCP) for the observation of mixing rates and mixing processes in the vicinity of intrusions. The evaluation of long-term records by Holtermann et al. (2019) showed that intrusions are ubiquitous features in the central Baltic Sea. Intrusions determine the depth of the redoxcline, and import, over decadal time scales, considerably more oxygen into the deep layers of the Baltic Sea than the more well-known Major Baltic Inflows (MBIs). The turbulence sensors mounted on the autonomous profiling platform provided a number of especially suprising results. Different from previous assumptions, they did not show any indications of enhanced shear-induced turbulence in the vicinity of intrusions or even during an MBI that occured during the measurements (Holtermann et al., 2017), supporting the view that most of the deep-water mixing occurs in the turbulent bottom boundary layers. Secondly, our moored turbulence observations also provided the first direct evidence for the important of diffusive convection (Holtermann et al., 2017; Umlauf et al., 2018). It has long been speculated that this particular mixing process, relevant especially in the Arctic Ocean, might also be relevant in the Baltic Sea. Our study has also shown that the mixing of intruding and ambient waters has an important effect on the abundance, activity, and gene expressions of microorganisms in the vicinity of redox interfaces (Schmale et al., 2016; Beier et al., 2019). 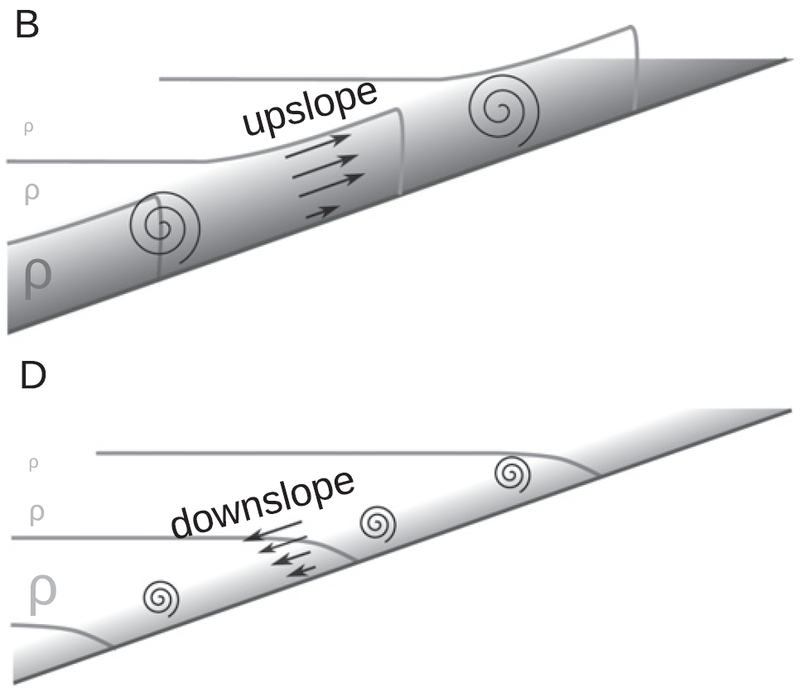 Schematic view of the turbulent bottom boundary layer during different phases of an oscillating cross-slope flow. 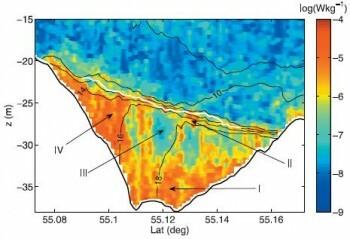 The gray-shaded areas near the bottom denote regions with suspended sediment. Modified figure from Schulz and Umlauf (2016). Turbulent bottom boundary layers (BBLs) are important hotspots of energy dissipation, mixing, and transport processes in most marine and limnic systems. They often provide an essential contribution to basin-scale energy dissipation and mixing, determine the exchange of dissolved substances between the sediment and the water column, and control the transport of suspended material. 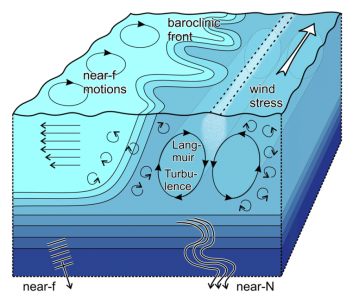 Our group has focused in the past in particular on stratification effects in oscillating boundary layers near topographic slopes, including those generated by barotropic and baroclinic tides, near-inertial waves, and so-scalled internal "seiches" (long standing internal waves) in lakes. Together with physical limnologists from the EAWAG (Switzerland), we investigated the basin-scale effects of periodically unstable boundary layers in small lakes with the help of a high-resolution numerical modeling study (Becherer and Umlauf, 2011; Lorrai et al., 2011). Using a simple one-dimensional theoretical framework, we showed how important BBL properties like the mixing effeciency and the residual transport changes as a function of forcing conditions, slope, stratification, rotation rate, and other relevant parameters (Umlauf and Burchard, 2011; Umlauf et al., 2015). As one result of this work, it turned out that oscillating boundary layers near sloping topography have many similarities with tidal straining processes in regions of fresh-water influence in estuaries and the coastal ocean. Schulz and Umlauf (2016) and Schulz et al. (2017) showed that asymmetries in turbulence in oscillating BBLs result in residual sediment transports, which are likely to occur everywhere in the ocean where a stratified oscillating flow occurs in the vicinity of sloping topography. Gravity currents in rotating reference frames are a fascinating and, due to their importance for the ocean general circulation, intensively studied topic. Gravity currents in the virtually tideless Baltic Sea occur at much shallower depths and exhibit smaller spatial scales than their large-scale counterparts in the deep ocean. Nevertheless, they share many features with these large-scale overflows, e.g. the high Reynolds numbers, strong rotational effects, and subcritical Froude numbers. The smaller spatial scales make the gravity currents in the Baltic more easily accessible for high-resolution measurements of hydrographic and turbulence parameters. We exploit this advantage, and use the Baltic Sea as a natural laboratory for deriving generally applicable models of rotating bottom gravity currents (Umlauf and Arneborg 2009a,b; Arneborg et al., 2007; Umlauf et al., 2007). 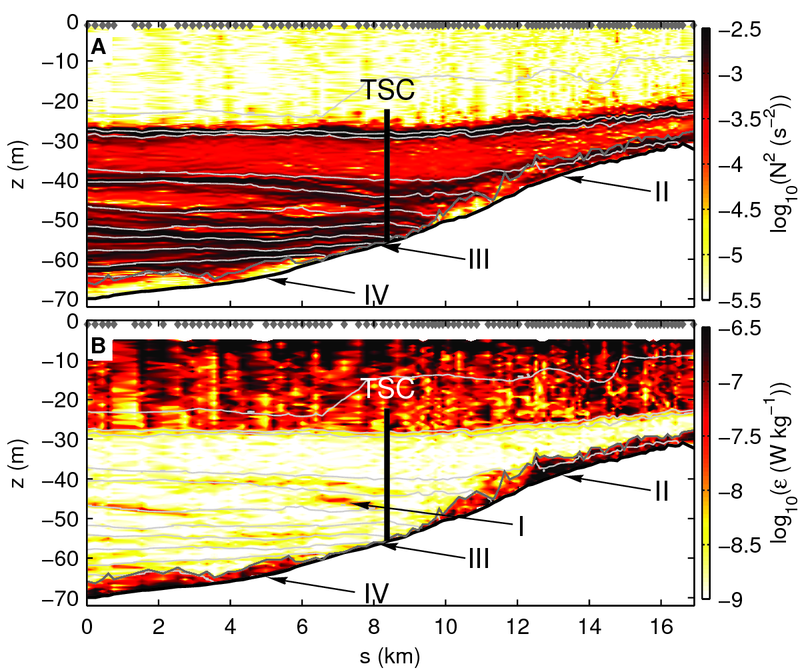 As an example for the available data sets, the figure to the right shows a complete microstructure and CTD transect across a gravity current passing through an approximately 10 km wide channel in the Western Baltic. The high sampling density (more than 70 profiles for this figure) allowed us to compute detailed transects of turbulence parameters across the whole width of the gravity current, from which the essential non-dimensional numbers describing rotating gravity currents can be derived: the Froude number, the Ekman number, the entraiment rate, the drag coefficient, etc. We collaborate with colleagues from IOW's regional ocean modeling group to gain a better understanding of the physical processes in such flows (Umlauf et al., 2010), and with researchers from other disciplines to investigate the biogeochemical implications of mixing in gravity currents (Schmale et al., 2016). Logarithm of (a) buoyancy frequency and (b) turbulence dissipation rate and density structure (black contour lines) from a transect across sloping topography in the Southern Baltic Sea. Adapted from Lappe and Umlauf (2016). Internal waves are ubiquitous features in the ocean. They play an important role in the energy budget of the ocean due to their ability to distribute energy over large distances, both vertically and horizontally, and among a large range of scales by non-linear interactions and their ability to generate small-scale turbulence by breaking. The latter is believed to be an important energy source for diapycnal mixing of heat, salt, and dissolved substances. In our group, we use the Baltic Sea as a natural laboratory to study these processes with focus on wind-generated near-inertial waves. These waves with a period of approximately 14 h often form the strongest signal in measured and modeled currents. 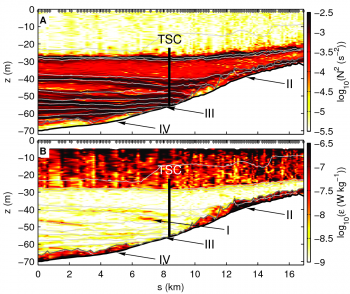 We showed that the vertical shear associated with the near-inertial waves triggers shear instabilities, and thus mixing, in the strongly stratified interior region of the deep basins of the Baltic Sea (van der Lee and Umlauf, 2011). 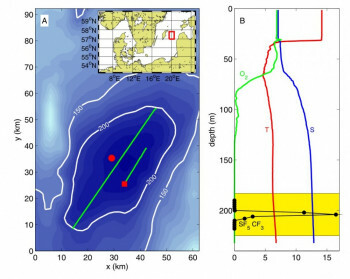 More recently, measurements near one of the slopes of the Bornholm Basin (see figure to the right) showed that near-inertial waves are also one of the most important energy sources for boundary mixing (Lappe and Umlauf, 2016). This is in line with results from the Baltic Sea Tracer Releaser Experiment (Holtermann et al., 2012; Holtermann and Umlauf, 2012; Holtermann et al., 2014), suggesting that boundary mixing processes dominate net vertical mixing in the deep layers of the Baltic Sea. The focus of this area of research is the development and testing of turbulence models for stratified turbulent flows. The class of models we are mainly interested in are so-called one-point turbulence closure models, in particular second-moment closures. Among the models developed by our group is a version of the k-ω model for stratified flows (Umlauf et al., 2003), and a generic length scale model (GLM) from which almost all traditional models (e.g. the k-ε model and the Mellor-Yamada model) can be recovered as special cases (Umlauf and Burchard, 2003). More information about these and related models can be found in the review article by Umlauf and Burchard (2005). The turbulence models developed by us and other groups are implemented in our public domain turbulence library GOTM (Umlauf et al, 2005). Either via an interface to GOTM or as stand-alone versions, these turbulence models have been implemented in a number of three-dimensional ocean models (ROMS, OPA, MOM4, POLCOMS, GETM, etc.). For more information about GOTM and our three-dimensional circulation model GETM, check out our web sites at www.gotm.net and www.getm.eu. One of the outstanding questions for the Baltic Sea ecosystem is how physical and bio-geochemical properties of the deep layers communicate with the surface mixed layer where production takes place. In a joint project of IOW and GEOMAR (Kiel), we investigated these mixing processes in the framework of the Baltic Sea Tracer Release Experiment (BaTRE), conducted in the years 2007-2010. In collaboration with the tracer research group of Jim Ledwell (WHOI), a new type of tracer, CF3SF5, was injected in September 2007 into the deep waters of the Eastern Gotland Basin with the help of the new Oceanic Tracer Injection System (OTIS) built for this project (see Umlauf et al. 2008). The figure to the right shows the study area, the vertical distribution of the tracer (markers in highlighted area), and some hydrographic parameters as measured approximately two weeks after the injection. The experiment was accompanied by extensive turbulence measurments in order to obtain direct mixing estimates for comparision with the basin-scale mixing inferred from the vertical spreading of the tracer cloud. Combined with additional moored instrumentation (ADCPs, current meters, CTD loggers), a coherent data set could be obtained. 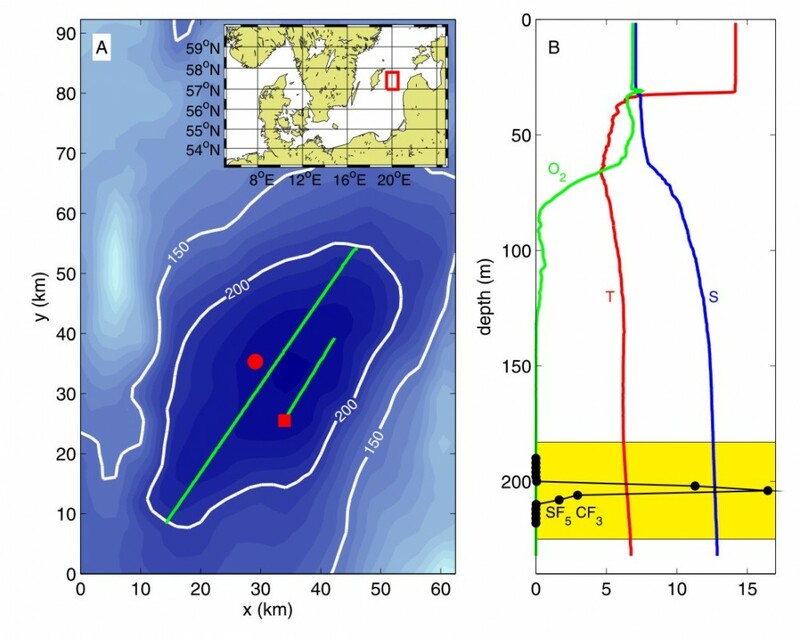 A key result of this project was the observation that deep-water mixing in the central Baltic Sea occurs almost exclusively in the turbulent boundary layers on the topographic slopes of the basin (Holtermann et al., 2012; Holtermann and Umlauf, 2012). This finding challenged the traditional view about how mixing works in the Baltic Sea, and how it should be parameterized in numerical models (Holtermann et al., 2014).